The largest transport petition in at least 20 years will finally be tabled in the Victorian Parliament this week. More than 13,000 people signed the Eastern Transport Coalition's Monster Petition, which calls on Government to address significant gaps in Victorian transport planning, including conducting feasibility studies on rail links to Rowville and Doncaster. The Greens have committed to feasibility studies for Rowville and Doncaster rail, whilst The Liberal Party have committed to feasibility for Rowville rail only. 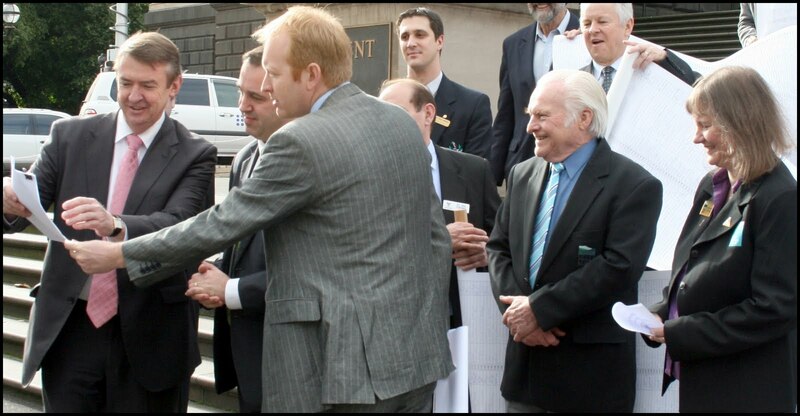 Here Opposition Spokesperson - Terry Mulder, Minister for Public Transport - Martin Pakula and Greens Spokesperson - Greg Barber look at the detail of the monster petition whilst I as chairperson of the ETC and Mayor of Yarra Ranges, Cr Len Cox look on. The residents of the East have for too long been neglected by governments of all persuasions. It's time this government looked seriously at providing sustainable transport options right across Melbourne rather than focusing on a few key electorates. The Eastern Transport Coalition represents seven councils in the East whose residents are crying out for more public transport. The petition being tabled this week has more than 13,000 signatures, each one of them a demand of Government to end the neglect. The ETC petition calls on the Victorian Government to address the significant gaps in the provision of and planning for public transport in Greater Dandenong, Knox, Manningham, Maroondah, Monash, Whitehorse, and Yarra Ranges. The level of public transport dissatisfaction in the Yarra Ranges had been growing for some time. Our residents are sick of being ignored when it comes to public transport policy. They are crying out for a solution. It's about time the government paid attention to the calls for better transport in the East, I look forward to government taking notice. This election year provides a perfect opportunity for this government to show that it is listening to the million or so residents east of Warrigal Road who are forced to drive their cars to work because they have few viable alternatives. The Eastern Transport Coalition is very pleased that the Victorian Liberal Party and the Victorian Greens have committed to a feasibility study for Rowville rail whilst the Victorian Greens have also committed to a feasibility study for Doncaster rail too if they're elected – and we're calling on anybody who wants to govern in Victoria to realise that the East is crying out for better transport.